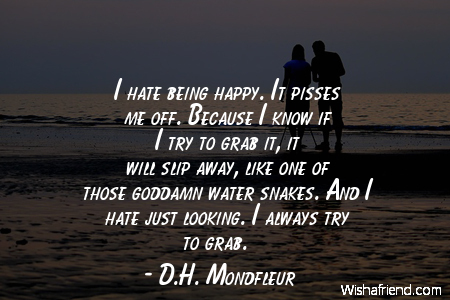 D.H. Mondfleur Quote: I hate being happy. It pisses me off. Because I know if I try to grab it, it will slip away, like one of those goddamn water snakes. And I hate just looking. I always try to grab. I hate being happy. It pisses me off. Because I know if I try to grab it, it will slip away, like one of those goddamn water snakes. And I hate just looking. I always try to grab.